Though it now boasts one of the most vibrant Mardi Gras parties in the world, Brazil did not always celebrate this way. Dating back to 1723, Carnival was brought to Rio de Janeiro by the Portuguese. Their way of celebrating meant groups of men taking to the streets on Fat Tuesday and throwing buckets of water on anyone who dared to leave their houses. Believe it or not, this tradition wasn’t exactly enjoyed by the masses. It tended to cause riots and fighting across the city. It wasn’t until the 1850s that Rio began to change their Carnival traditions, trading surprise dousings for floats drawn by horses. These parades quickly organized, including military bands and dancers in their promenades. It’s actually these parades that helped to make Rio’s Carnival so historically prominent. In the late 1800s and early 1900s the Brazilian people used these parades as political commentary. They created floats and promoted dialogues that spoke out against the state of national politics. Nowadays, however, Rio’s Carnival celebrations focus less on political statements and more on their dance heritage. In 1917 Rio began incorporating the the Samba into their Mardi Gras parades. The Samba has grown in influence over the last century and now represents the pinnacle of Rio’s Carnival. Samba schools across the country dance in the parades and compete against one another throughout the streets, flashing elaborate costumes and show-stopping dance moves to a crowd hungry for the beat. 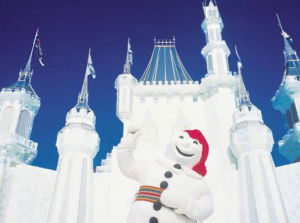 Bonhomme stands before his ice palace in Quebec. Brought to Canada by the French, Quebec’s Mardi Gras shares the same origins as us down here in New Orleans. But where our heat and humidity reign supreme, Canada has instead traded for a winter wonderland. Though Mardi Gras celebrations were present in Quebec early on in the 19th century, it wasn’t until 1894 that the first official Winter Carnival took place. Invented as a way to merge Mardi Gras celebrations and winter games, the Winter Carnival is intended to bring a brightness to the people’s long trudge through winter in the northern tundra. Obviously themed for the season in which it takes place, Quebec’s Winter Carnival has some snowy traditions. The whole city is decorated in snow sculptures and the week leading up to Shrove Tuesday (what we call Fat Tuesday) hosts bobsled races and an ice-cold canoe race down Quebec’s St. Lawrence River. Their Mardi Gras mascot is even a snowman named Bonhomme. To celebrate him, the crowds of Quebec don red hats and red arrowhead sashes, but that’s not all. At Quebec’s Place de l’Assemblée-Nationale the community builds Bonhomme a giant palace made solely of ice. As for Fat Tuesday itself, the Canadians call it “Pancake Day”, and in perhaps the most cosy of all the traditions we’ve discussed so far, they spend the morning warm in their houses devouring fresh pancakes covered in maple syrup. Brazil is not the only country that the Portuguese brought the Mardi Gras party to. Dating back over 500 years, Mardi Gras was celebrated in India by the Portuguese immigrants who colonized the Goa territory. While originally their celebrations maintained a European quality, as the years passed Goans began to imbibe Carnival with their own cultural heritage. As early as December the community begins decorating their streets and buildings with colorful streamers and ribbons, bringing an incredible vibrancy to Goa. Their Carnival is ruled over by King Momo, the King of Chaos, who begins the celebrations the Saturday before Fat Tuesday. He presents a decree demanding the people spend the next three days partying. King Momo, elected anew every year, parades through the streets of Panji with an entourage of fire-eaters, dancers, street performers, acrobats, and jesters, much to the joy of revelers across the city. These parades incorporate Hindu traditions, like throwing colorful chalks into the air, as a way to bring the culture of India into their Mardi Gras celebrations.